Good News:To thanks customer's support and also to promote "Sexiest Beaches", I'd like to give you this app 50% OFF ONLY 0.99$ for limited time!! 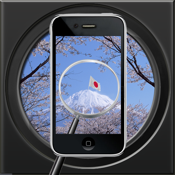 Thanks for your support to make Live Cameras around Japan to be one of the Top Paid apps around the world. You can watch Japan anytime in the real-time mode from your iPad now! Most of the intersting and fascinating places of the Japan will be in your palm, this app with most advanced technologies of video transmission to make the image quality is more confortable and transmission is more smoothly. What you see happens right now in your iPad is actually taking place in there. This App included the live cameras around Japan, so you can get to know a real Japan from what you have seen over your iPad. From this App you can get what the earthquake impact to Japan. you also can know the nuclear emergencies's impact to Japan. You also can know you also can watch the wave situation on the beaches, because it has collected nearly 20 cameras around the coastline. You also can watch Fuji mountain, it looks like the volcano is becoming active now. List View - List the thumbnail view is supported. Easy Navigation - Swipe back and forth between pages of cameras that are updating in real-time are supported. Random - Displays a random selection of cameras. Favorite - Display your favorite cameras. Snapshot - Save snapshots to your camera roll is supported. Help Center - Introduce the tips of how to play this app. Email - Email the best moment your captured to your friends are supported. Feedback - Write your feedback to developer is supported. Thanks for your support, we will keep improving the quality of our App and also add more good camera sites in the next upgrade. If you have any question or suggestion on the App, please feel free to send your email to ztian.appstore@gmail.com.